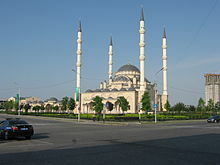 Chechnya has one of the youngest populations in the generally aging Russian Federation; in the early 1990s, it was among the few regions experiencing natural population growth. Since 2002, Chechnya has experienced a classic post-conflict baby-boom. Chechen demographers in 2008 termed highly implausible the reported overall population growth as infant mortality in Chechnya was said to be 60 percent higher than the Russian average in 2007 and to have risen by 3.9 percent compared with 2006. Many experts have expressed doubts about the increase from 1.1 million in the 1990s to an estimated nearly 1.3 million in 2010 following two devastating wars that displaced hundreds of thousands of people and virtually eliminated the large ethnic Russian minority in the republic. According to Russian demographer Dmitry Bogoyavlensky, the 2002 census results were clearly manipulated in the North Caucasus: an estimated 800,000 to 1 million non-existent people were added to the actual population of the region. Another Russian demographer, Anatoly Vishnevsky, pointed out that according to the 2002 census, some age groups, like those born in 1950, appeared to be larger in 2002 than in 1989. With the 2002 census, Moscow wanted to show there were not too many casualties and that the refugees had returned to Chechnya, while the local authorities wanted to receive more funds and thus needed a higher population to justify their demands. 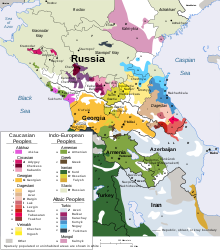 Also, in the multiethnic republics of North Caucasus normally unlike in other parts of Russia, government positions are distributed among the ethnicities according to their ratio in the general population. So ethnicities are zealously guarding their numbers in order not to be outnumbered by others and thereby left with less representation in the government and the local economy. Some 40 percent of newborns had some kind of genetic defect. ^ a b c d Liz Fuller (3 November 2010). "Preliminary Chechen Census Findings Unveiled". Radio Free Europe/Radio Liberty. Retrieved 12 March 2011. ^ a b c d e f g Dzutsev, Valery (2010). "2010 Census Data is Adjusted to Meet Kremlin Priorities in the North Caucasus". 7 (207). Retrieved 12 March 2011. ^ a b Jaimoukha, Amjad M. (2005-03-01). The Chechens: a handbook (1st ed.). Routledge. p. 110. ISBN 978-0-415-32328-4. Retrieved 2009-08-14. ^ "Ингушетия.Ru • Авторские Материалы". Archived from the original on 2008-02-17. Retrieved 2014-03-14. ^ Категория: Мировая история. "Аланский историк". 95live.ru. Retrieved 2014-03-14. ^ a b c d Schaefer, Robert W. (2010). The Insurgency in Chechnya and the North Caucasus: From Gazavat to Jihad. ISBN 9780313386343. Retrieved 25 December 2014. ^ a b c "The Ingush People". Linguistics.berkeley.edu. 1992-11-28. Retrieved 2014-03-14. ^ Cohen, Ariel (1998). Russian Imperialism: Development and Crisis. ISBN 9780275964818. Retrieved 25 December 2014. ^ "человек из камня БАЙСАНГУР БЕНОЕВСКИЙ". YouTube. 2010-12-10. Retrieved 2014-03-14. ^ Ben Cahoon. "Russian Civil War Polities". Worldstatesmen.org. Retrieved 2014-03-14. ^ Umarova, Amina. "Chechnya's Forgotten Children Of The Holodomor". Rferl.org. Retrieved 2014-03-14. ^ "Remembering Stalin's deportations". BBC News. 2004-02-23. Retrieved 2013-04-19. ^ "Book Reviews: 'Chechnya: A Small Victorious War' & 'Capitalism and Class Struggle in the USSR' | The Socialist Party of Great Britain". Worldsocialism.org. Retrieved 2014-03-14. ^ "'Dual attack' killed president". BBC. 1999-04-21. Retrieved 2016-01-01. ^ "F&P RFE/RL Archive". www.friends-partners.org. Retrieved 2016-01-01. ^ "Four Western hostages beheaded in Chechnya". CNN. Archived from the original on 2002-12-03. ^ "Gay Chechens flee threats, beatings and exorcism". BBC. Retrieved 10 October 2018. ^ "Gas 'killed Moscow hostages'". BBC News. 2002-10-27. Retrieved 2013-04-19. ^ "Moscow hostage relatives await news". BBC NEWS. 27 Oct 2002. Retrieved 30 May 2011. ^ Aris, Ben (2003-03-24). "Boycott call in Chechen poll ignored". Daily Telegraph. London. Retrieved 2013-04-22. ^ The Economist (2003-03-25). "Putin's proposition". The Economist. Retrieved 2013-04-22. 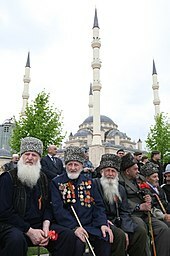 ^ "Russia 'ends Chechnya operation'". BBC News. April 16, 2009. Retrieved 2009-04-14. ^ Prague Watchdog (2008-02-11). 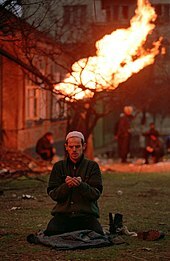 "Chechnya – The week in brief: 4–11 Feb, 2008". Reliefweb.int. Retrieved 2013-04-19. 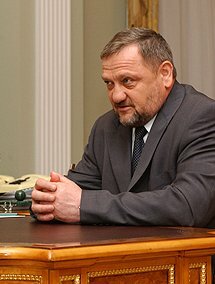 ^ "Каталог публикаций::Федеральная служба государственной статистики". Gks.ru. 2010-05-08. Retrieved 2014-03-14. ^ "НАСЕЛЕНИЕ ЧЕЧНИ". Ethno-kavkaz.narod.ru. Retrieved 2013-04-19. ^ "Перепись-2010: русских становится больше". Perepis-2010.ru. 2011-12-19. Retrieved 2013-04-19. ^ "В Чечне наблюдается высокая степень религиозной нетерпимости" [High degree of religious intolerance observed in Chechnya]. Caucasus Times poll (in Russian). 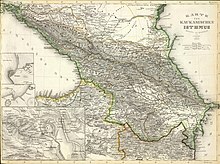 Caucasus Times. 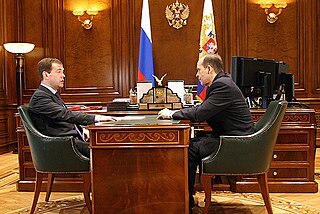 16 May 2010. Retrieved 10 April 2017. ^ "What is Hidden Behind the Idea of the Caucasian Emirate?" (PDF). Retrieved 2013-04-19. ^ Chivers, C. J. (31 January 2009). "Slain Exile Detailed Cruelty of the Ruler of Chechnya". New York Times. ^ a b Milashina, Elena (9 July 2017). "Это была казнь. В ночь на 26 января в Грозном расстреляли десятки людей". Novaya Gazeta. Moscow. Retrieved 10 July 2017. ^ "Who Is Afraid of Navalny, Killings in Chechnya, Trump-Putin Meeting". Institute of Modern Russia. 14 July 2017. Retrieved 17 July 2017. ^ "Over 100 people allegedly sent to 'concentration camps' for gay men in Chechnya – Independent.ie". Independent.ie. Retrieved 2017-04-11. ^ "Расправы над чеченскими геями" (in Russian). Retrieved 2017-04-12. ^ a b Russell, John (2007). Gammer, Moshe; Lokshina, Tanya; Thomas, Ray; Mayer, Mary; Dunlop, John B., eds. "Chechnya: Russia's 'War on Terror' or 'War of Terror'?". Europe-Asia Studies. 59 (1): 163–168. JSTOR 20451332. Doku Khamatovich Umarov ; also known as Dokka Umarov as well as by his Arabized name of Dokka Abu Umar; was a Chechen Islamic extremist militant in Russia. 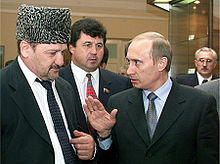 Umarov was a major military figure in both wars in Chechnya during the 1990s and 2000s, before becoming the leader of the greater insurgency in the North Caucasus. 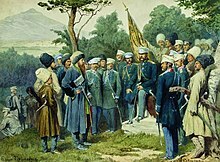 He was active mostly in south-western Chechnya, near and across the borders with Ingushetia and Georgia. 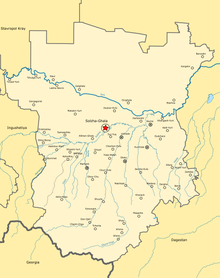 Vilayat Galgaycho was an Islamist militant organization connected to numerous attacks against the local and federal security forces in the Russian regions of Ingushetia and Chechnya in the North Caucasus. Since 2007 it has been a part of the Caucasus Emirate and takes part in the Insurgency in the North Caucasus. The group is thought to be responsible for the deaths of hundreds of people, mostly policemen, military personnel and officials. Vainakhia, a historical territory of Chechens and Ingush, is located in the Russian Caucasus. 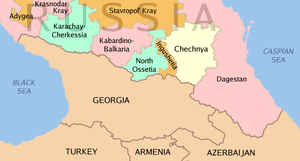 It includes the historic lands of Vainakh Chechnya, Ingushetia, the eastern part of North Ossetia and parts of north and west Dagestan. It has many historical sites. 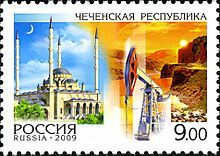 In 2004, rebels attempted to create a Vainakh republic by merging Chechnya and Ingushetia.